Elvis Halilović, portrayed with his camera obscura. Few days ago I’ve made a portrait of Elvis Halilović. He designed super slick camera obscuras and made them from wood. They look super cool. He started ONDU Pinhole Cameras project on Kickstarter, aiming for $10.000 USD of backing and three weeks before the end of kickstarter project he has already pledged for $63.000 USD. Check his project and back him. For now, that’s the only way how to get the camera, but he has many worldwide offers for his product. I’ve done his portrait with his camera, but since I didn’t had a clue what angle of view is, I totally missed the framing. In tomorrows Mladina weekly it’ll be published his collodion portait. At European Collodion Weekend I bought one old brass Petzval lens and check the results. I suggested Elvis that with this cameras also wet plate collodion process could be done, since it uses ordinary 4×5″ film holder. He will lend me one for a ride. Can’t wait! Elvis Halilović an industrial designer and his camera obscura product and Borut Peterlin with his 4×5″ camera and Petzval lens. Sorry, I haven’t been posting for a very long time. I think I will in the future post more frequent and shorter posts. I hate this kind of report what was going on last couple of weeks. Then again I would hate if I wouldn’t share this experience on the blog. The strangest thing happened with my wet plate collodion chemicals. On Wednesday I’ve made the portrait of Nana Milčinski without a problem and the very next day I couldn’t make a decent picture. It took me more then a week to figure out what went wrong and I’ve burned lots of nerves. I’m not going to go into chemical details, but I’m happy I’ve solved the problem. Luckily if a wet plate gets all dirty and full of stains, you can call it an art and you get away with it. You can see the stains and fog that is appearing on some pictures. I’m happy that I’ve resolved the problem/s and on the end of the day I’ve learned a lot. Really a lot. I’m finally at the stage that when a problem occurs I can systematically find it and resolve it. 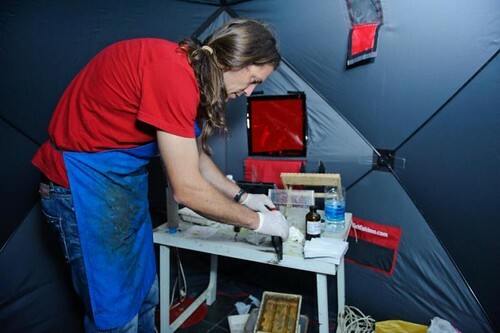 The worst thing was that this problems were occurring when I had to do a demonstration of a wet plate collodion technique on two photo-fairs in Maribor and in Zagreb. Very stressful! 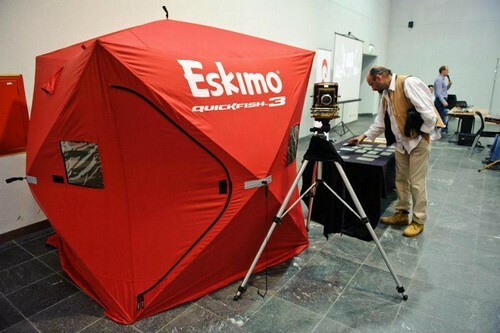 Oh… I’ve bought a tent Eskimo QuickFish 3 and now I have a mobile darkroom. It’s very good, although joints are not strong enough so I’ve asked my friend to reinforce them. BUt it’s a joy to work in it. I set it up in 40 seconds! Today, 16th of September 2012 is the 90th birthday of Božena Pelikan, the youngest daughter of famous photographer Josip Pelikan. As a homage to famous Pelikan family and a humble gratitude to the photographical heritage of Pelikan family, I’ve made portraits of Mrs. Pelikan. I used Vageeswari 10×12″ camera with sheet film of 8×10″ and a lens Voigtlander Heliar 300mm, f/4,5. For Wet Plate Collodion portraits I used a Plaubel 5×7″ camera and I’ve made some quick takes also with Mamiya C330, format 6×6. With Museum of Recent History Celje, we’re discussing projects that we might do together and I’m all excited since potentials are enormous! The studio is without a doubt one of the best preserved luxurious glass photographic ateliers in Europe with original equipment used by the famous Slovene photographer Josip Pelikan (1885–1977). More about it on the links bellow. Borut Peterlin during photo-session with Mrs. Božena Pelikan. Assistent Tomaz Strmcnik. Photo Helena Vogelsang. Camera Plaubel 5×7″, Wet Plate Collodion, Flashes Balcar 1500Ws & ’50Ws. In last issue of Mladina weekly it was published my portrait of Silence band. I had this idea for a while, but some people were not feeling comfortable with it, but on the contrary with the duo Silence we had a good laugh and the result overpassed my expectation. 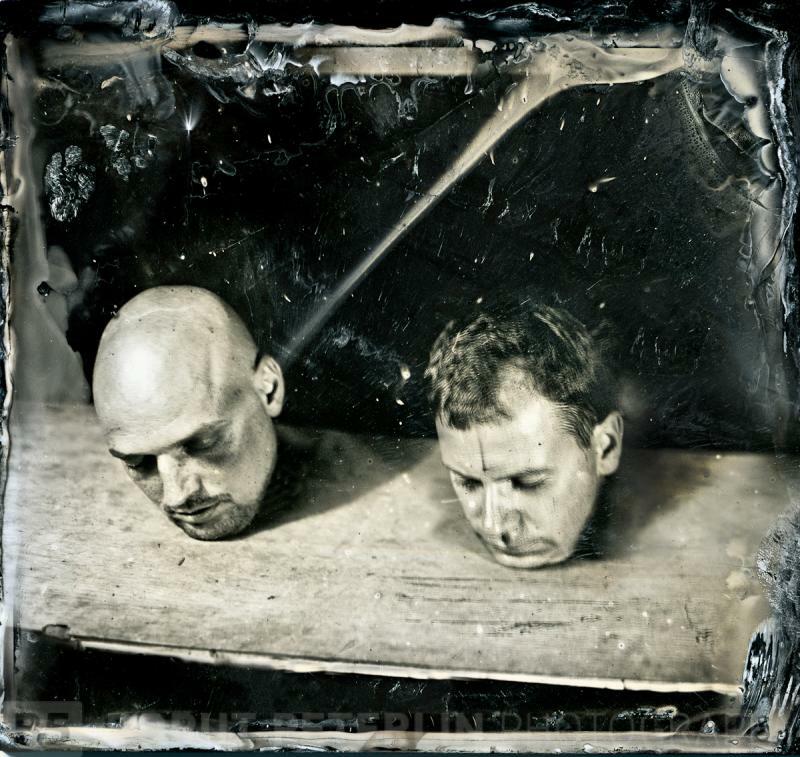 My collodion needed a two pops of 2250Ws to illuminate it correctly, that is why Primož on the right side is a bit blurred. Later I find out that it could be done in one pop if I would raise pH of AgNO3 from 2,2 to 4pH as I did later on and described in THIS post. Techs: ShenHao 4×5″, lens Linhof 135mm f/3,5; Flashes of 2250Ws – two bursts, AgNO3 pH 2,2. Yesterday my family had a family lunch and a celebration of my father’s birthday, so I used this opportunity to make a new set of family portraits. Recently I reset and readjust my chemicals, so I was anxious to see how my pictures will turned out and here they are! Technically I used Palubel 5×7″camera with Voigtlander Heliar 300mm f/4,5 lens at aperture 6,7 and illuminated by one flash burst of two flashes of joined power 2250Ws. Flashes were about 90cm away from the subject. This plates along with others will be exhibited in Kulturni dom, Gorica in Italy. The opening will happen on 29th of September 2012. You’re invited. Last week I was on a vacation and I’ve read a book review of newest project by Paul Graham at Aphotoeditor by Robert Haggart. I’ve first encountered Paul Graham’s work at an exhibition at Month of Photography in Bratislava, year 1994. It was an exhibition of New British Documentary Photography. When I was in Fabrica, Benetton’s communication research centre, year 2000, he had a two days workshop there. Until then I didn’t fancy his aesthetic, but I understood his topics and I loved his early works especially Beyond Caring and Troubled Land. His work you don’t understand on a first glance, it took me a while of reading and contemplation to get familiar with the idea that war photography can be done with medium format camera from far and it’s OK, that your pictures aren’t good enough because you’re not close enough. While we had a workshop together he asked from us to go out and make pictures, that we wouldn’t otherwise, we were asked to make mistakes, rigorous technical and compositional mistakes. We went out and each of us shot a roll of film and I took it as a joke, throwing camera in the air and taking pictures with a timer on and of course nobody took an effort to look trough a viewfinder. And accordingly that’s how our pictures look like, a one big mess! Paul came along and start shuffling pictures and out of this mess of unsharp, blurry, over&under exposed pictures made a series that actually looked really cool! Then he was talking about possible connotations that this kind of aesthetic could be applied to. I was astonished! What a good workshop! So when I read the book review that I’ve mentioned before I clicked through the book and as always it’s not on a first ball as we say it, but as all Graham’s projects it takes some time to get familiar with his new “invention” in photography. To be honest my belief was that diptychs, triptychs and other typtichs are for photographers who can not make a good picture, then they do some distracting maneuvers with juxtaposing several images together. In 99% it’s like that, if you ask me, or even more if the theme of the series is dealing with identity of a photographer (grow up!). Wet Plate Collodion – silver-nitrate bath pH problem resolved! Recently I’ve noticed that I have a problem with silver-nitrate bath in my Wet Plate Collodion photography. I’ve done a successful portrait of Neža Peterca for Mladina weekly and then I’ve made another one of Damjan that was assisting me and this thing happened! I know this edge of fog is because of uneven dipping to the silver-nitrate solution, but if this happens only “boiling” bubbles occurs and not this fog! Than I noticed that the fog is also on the Neža’s portrait! And also on other portraits! Oops! Those small lines are of course caused by AgNO3, but I didn’t thought it’s caused or at least related by a low pH issue!?! I_knew it’s a pH issue in my silverbath, but I had two or even three litmus papers and each of them was showing different results. I had enough of this and I’ve bought an electronic Ph checker and also a buffer pH4. I calibrated my checker so it was exact on two decimal numbers! No pH will mess around with me, I tell you! The measurement was shocking. My silver-nitrate bath was 2,2pH and it should be pH4! I’ve read Timmerman’s post on maintinace of AgNO3 bath, so I was going to cook! I evaporated 80% of solution and then I add fresh water, hoping that will fix the pH issue. It was better, but far from the wanted result. My AgNO3 solution was pH 2,8, but it was really clear (after I filter it) and real beauty on which I was resting my eyes! I know it sound weird, but wetplaters we find beauty everywhere. The issue of pH was still there, although my plates were good for my standards and I never had them so clean 🙂 Check my first picture below. I’ve bought 10 ml of concentrated ammonium in a local drug store and I add only on small drop to 350ml of AgNO3 solution and the effect was immediate, from 2,8 pH to 3,8pH. Then I redid the test and results are published and commented bellow.